Department of Theory of Foreign and Security Policy (Katedra Teorii Polityki Zagranicznej i Bezpieczeństwa) offers the undergraduate (first degree) course „Security Studies”, taught in English, carried out by experienced lecturers at the University of Lodz. „Security Studies” course in English is offered by the Department of International and Political Studies at the University of Lodz. Students in the „Security Studies” course will have the opportunity to broaden their knowledge and interest by attending courses in English language offered by other specializations, including „American Studies and Mass Media”, „International Cultural Studies”, „International Marketing” and „Asian Studies”. Security is always relevant. Governments, security institutions, think-tanks and newspapers are the places where the expertise of a well prepared analysts will be needed. „Security Studies” will provide you with the necessary knowledge about the contemporary threats and prepare you to analyze the security problems of the 21st century. Along with the three-year study in Poland at the Lodz University, students of the „Security Studies” are able to study under the Erasmus+ program at a foreign partner university for a maximum of one year (two semesters). Faculty of International and Political Studies at the University of Lodz has more than 320 places to travel abroad in more than 100 universities in 25 European countries (Austria, Belgium, Bulgaria, Switzerland, Cyprus, Czech Republic, Germany, Spain, Estonia, France, Greece, Croatia, Hungary, Italy, Ireland, Lithuania, Norway, Netherlands, Portugal, Romania, Sweden, Slovenia, Slovakia, Turkey, United Kingdom). Each student qualifying for the study abroad program receives a grant to cover portion of the costs associated with maintaining abroad. University of Lodz is also a partner in 5 Erasmus Mundus program. Its aim is to provide students and staff with exchange opportunities with other European Union member states and partner countries. It includes many mobility scholarships of various duration. Students will also have the opportunity to apply to participate in a number of practices, internships, workshops in schools and institutions, both Polish and foreign. Students of the Faculty of International and Political Studies at the University of Lodz have held positions in the European Parliament, NATO, diplomatic posts around the world as well as at research and scientific institutes. „Security Studies” is an answer to the growing interest in security issues and awareness of the existence of non-military threats present in the contemporary world. The „Security Studies” course offers engaging lectures conducted by specialists in their fields and practitioners working in government institutions, local authorities and international organizations. The undergraduate student will obtain comprehensive knowledge about contemporary international security. 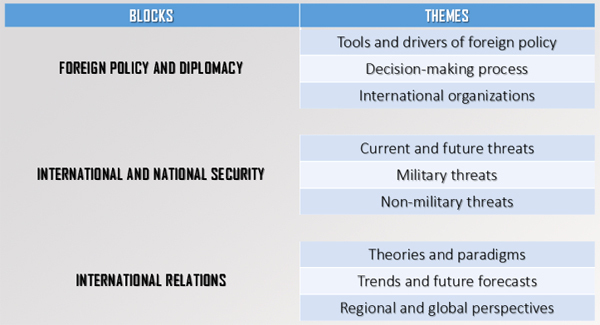 In this context it is important to learn about the objectives and conditions of security policy in the global and European security systems; foundations of the theory of national security policy; doctrinal and institutional elements of the functioning of state and non-state actors of international relations who shape the security environment; the evolution of views on the role of powers in shaping the international security; security forecasts. Students will come away with an understanding of the factors affecting international security, the role and place of military and non-military instruments. It is also important to have knowledge of the historical and contemporary aspects of armaments and disarmament. The program has been especially prepared in order to gain not only theoretical knowledge but also practical knowledge needed in the professional life. Besides theoretical classes (lectures and seminars), there are also practical classes. In the course of study, students will have the opportunity to participate in numerous extra-curricular activities, including meetings with guests from the world of media, politics and security (both civilian and military) and participate in field trips – to military units and other places associated with the broadly defined security. Classes will be conducted in three thematic modules – international security, international relations and diplomacy, and foreign policy. Each student will have the opportunity to freely choose their specialization classes. The classes are also taught by invited foreign lecturers. Additionally, students will take 120 hours of language classes and will have the opportunity to attend additional classes in Polish language. Details regarding admission procedures at the University of Lodz (Including visa Requirements, deadlines, documents required) are available [here]. Students must have an appropriate level of English knowledge in order to be able to actively participate in the activities, including discussions, exams and presentations. An additional 100 EUR registration fee applies. Fee might change. Please regularly check the University of Lodz website for updates regarding payments. Price for the European Union/EFTA citizens (580 EUR) is estimated. Please check the current exchange rate. PLN price serves as a reference and is binding. International students who wish to study in Poland can apply for various scholarships which either exempt them from paying a tuition fee or serve to defray their living expenses in Lodz. Foreign born Poles applying for a scholarship awarded by the Government of the Republic of Poland should contact the Polish Embassy or the Polish Consulate at their permanent place of residence to receive further information concerning the scholarship. Applicants from outside the European Union/EFTA may wish to [read more] about the Mobility Direct framework which gives students of all non-EU countries the opportunity to study with us for one semester tuition free. Details about deadlines available [here]. Please direct all inquiries to security-studies@uni.lodz.pl or in person at the Department of Theory of Foreign and Security Policy (Katedra Teorii Polityki Zagranicznej i Bezpieczeństwa), Room 112, Składowa Street 41/43, Łódź (Institute of Political Studies building).